KATHMANDU, August 29: As the local polls in Province 2 is fast approaching, various major parties have started looking for electoral alliance to strengthen their position. While some are currently holding discussion within their parties, others have already started negotiations to forge electoral alliance. 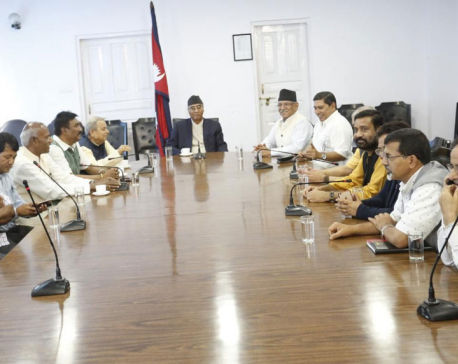 The ruling CPN (Maoist Center) has announced its intention to forge electoral alliance, wherever possible, with Bijaya Kumar Gachchhadar-led Nepal Democratic Party (NDP) and Upendra Yadav-led Federal Socialist Forum Nepal (FSFN). “We have decided to give priority to forge electoral alliance with the FSFN and NDP in Province 2 local elections. Although we have already initiated negotiations, we are yet to reach any formal agreement so far,” said senior Maoist Center leader Narayan Kaji Shrestha. The local polls in Province 2 in the third phase are scheduled for September 18. Top leaders of the Maoist party are scheduled to hold a function in Janakpur on Tuesday as part of their election campaign in Province 2. While senior UML leader Madhav Kumar Nepal is busy intensifying party's election campaign in various districts including Bara, Parsa and Rautahat, the Nepali Congress is also quietly expediting poll campaigns in the districts of Province 2. Earlier, the NC had announced to work for securing victory in at least 100 of the total 136 local units in Province 2 in order to stand as the largest party. The UML is so far ahead of NC in terms of election victory in the recent polls by securing victory in 50 more local units.